Barbier was a leading figure in the birth of the Art Deco style and renowned for his exquisite illustrations that capture the mood, fashion & atmosphere of the 'Roaring Twenties'. He also frequently contributed to many important fashion publications and is regarded as aprincipal artist of the time frame. 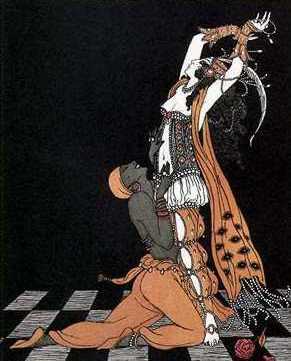 Georges Barbier became most famous with the publication of two rare albums representing the dancers Nijinsky and Karsavina in the years 1913-1914 as illustrated above. A prolific designer, Barbier worked for many years in the field of theatre design, cultivating an aptitude for vivid colour effects derived from the example of the revolutionary Russian artist, costume and set designer Léon Samoilovitch Bakst. Appearing in 1913, this was the first book of its kind illustrated by Barbier which is really an album of drawings of the God of Dance Vaslav Nijinsky' principal ballet dancer with the Ballets Russes, pictured in his various roles with Diagileff's ballet in Paris. Incredibly, a copy of the rare book turned up at a yard sale in Toronto and was bought for just $1.00 recently. Records show that the auctioneers Christies sold one just like it for $3,000.00 USD. Barbier's career did not accelerate until he was nearly thirty. However, his drawings were so exceptionally good that his career could never said to have stopped, even after his death. Barbier's art deco designs drawings are still so popular that they continue to thrive in reprint form and also on such varied objects as ceramics to stationary and even perfume bottles. 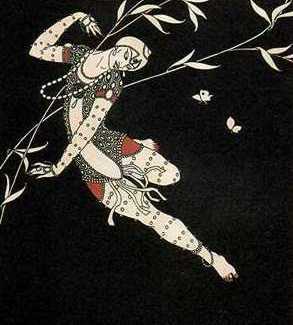 George Barbier, theatre design, Nijinsky, karsavana, parisian fashion, Dessins sur les danses, Vaslav Nijinsky ,art deco, designer, art deco style, illustrations, french, designer, roadshow, rare books,La belle Édition, 'Dessins sur les danses de Vaslav Nijinsky 1913' illustrator, ballet russe, albums, roadshow, rare, books, rare books, Artiques roadshow, Road show, British Artiques roadshow, David freeman, Freemanart consultancy. Freemanart Consultants.